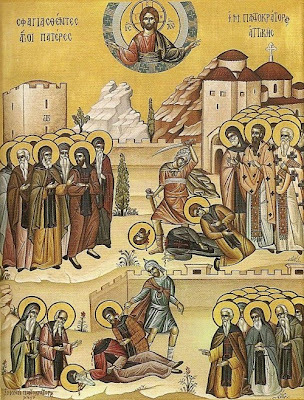 The horrifying account of the martyrdom of the 179 holy martyrs of Pantokratoros Monastery in Ntaou Penteli was recorded soon after the event of 1680 by Cyril Degleri, abbot of Penteli Monastery. 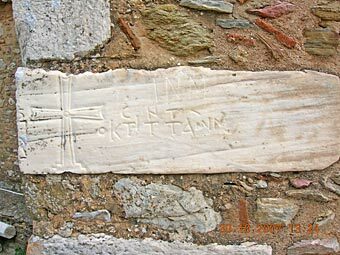 He and others record how Algerian pirates (some say they were Turkish or Albanian-Turkish pirates) docked their ship at the nearby port of Rafina during Holy Week of 1680. 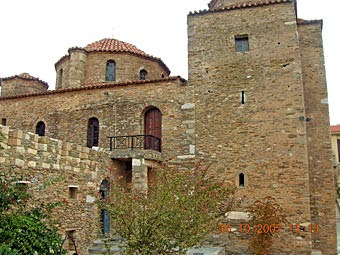 After failing in their raid of the fortified Ntaou Penteli Monastery in search of its treasures, under mysterious circumstances a servant of the monastery decided to betray the fathers and told the pirates of an access point otherwise unknown to outsiders (and recently discovered by archaeologists). On Pascha, during the midnight service, after the final "Christ is Risen!" was joyfully chanted by the fathers following the Divine Liturgy, the pirates stormed into the katholikon and began the gruesome slaughter. 179 monks and hieromonks, including the abbot, were massacred by the pirates. The pirates took their treasure and escaped back to Rafina, after having set fire to the monastery. Two escaped martyrdom however. One was a hieromonk and the other was a novice. They were not at the monastery that tragic evening, as they travelled to neighboring Nea Makri to serve the Paschal Divine Liturgy at a metochion of Pantokratoros Monastery where there were monks that kept the animals and farms of the monastery in Herotsakouli. 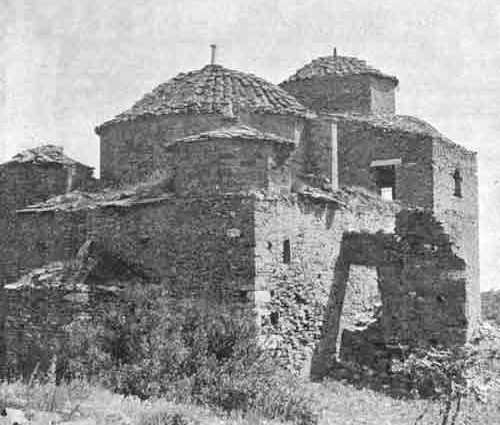 They returned to Ntaou Penteli on Pascha Sunday evening only to find two dead monks at the entrance and their monastery burned down, save for the katholikon (which survives till today). When they entered the katholikon, they saw dozens of the fathers in a pool of blood. Some had been severely beaten, while others were cut in pieces. On Bright Monday morning the heiromonk and the novice set out to seek help in burying the martyred monks from the neighboring fathers of Penteli Monastery, otherwise known as Dormition of the Theotokos Monastery. On the way they had a view of the port of Rafina and saw the pirates leaving. 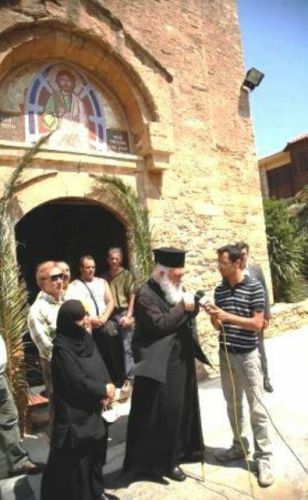 When the fathers of Penteli Monastery heard of the massacre, they went to Pantokratoros Monastery in Ntaou Penteli and helped bury all the bodies after a Bright Week funeral service was performed. The names of the holy martyrs and the location of their burial were lost to history...until 1963. 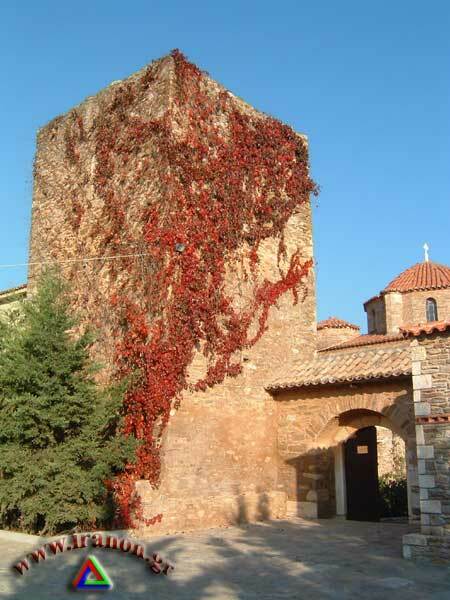 Pantokratoros Monastery was built before the tenth century over the ruins of older churches and before that an ancient Greek temple. It is of the same architecture as Armenian and Georgian monasteries. 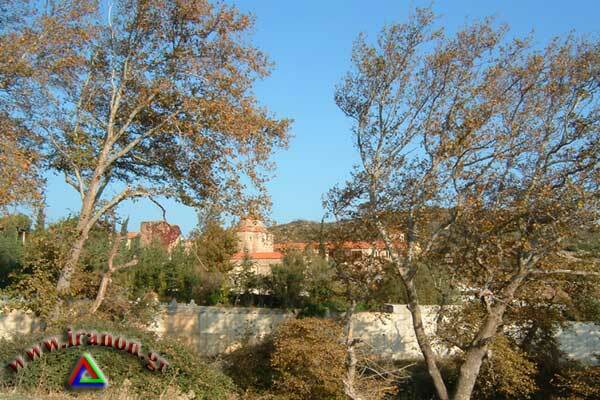 It was named Ntaou after the ancient Greek epigram "Tao" found at the monastery. 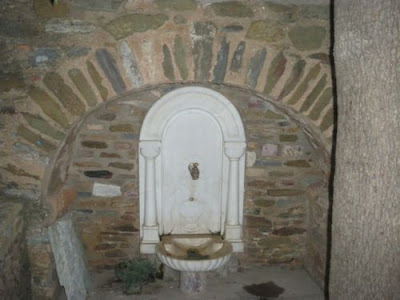 The founder was Nikos the Kamatiros and before the Ottoman occupation probably had over 600 monks. In its history it endured fires, as well as capture by the Franks and the Turks. 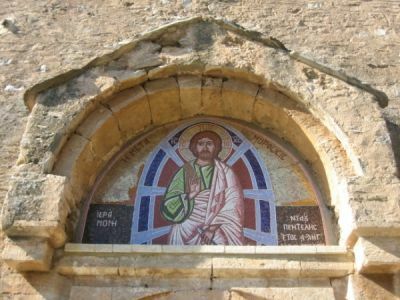 It is in the district of Ntaou to the east of Mount Penteli. 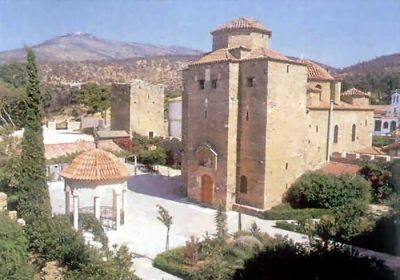 Mount Penteli, or Mount Amomon, was surrounded by many monasteries. This is why it was called the Mountain of the Pure because it was filled with monastics (Amomon means "pure"). Pantokratoros Monastery became a metochion of Penteli Monastery which was further up the mountain after its destruction in 1680. 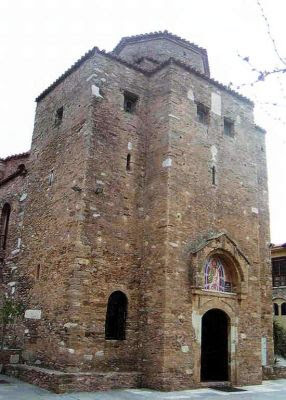 In 1692 Penteli Monastery was recognized by Ecumenical Patriarch Cyril as stavropegial along with the Holy Monastery of Ntaou Penteli and the Holy Monastery of Saint Nicholas Kalision, which means that the monasteries were now directly under the Ecumenical Patriarch and not the local bishop (today they are once again independent). From 1680 until 1963 Pantokratoros Monastery in Ntaou Penteli was deserted, except for one monk to take care of the grounds. In 1963, 283 years after the massacre, eleven nuns from Saint Patapios Monastery in Loutraki came with the blessing of Archbishop Chrysostomos of Athens to Ntaou Penteli to revive it. 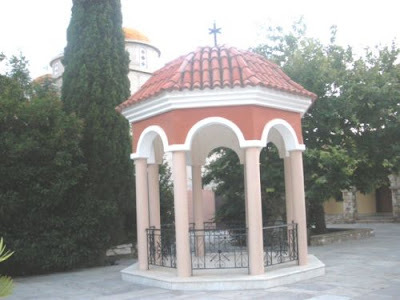 It was still a metochion of Penteli at the time. 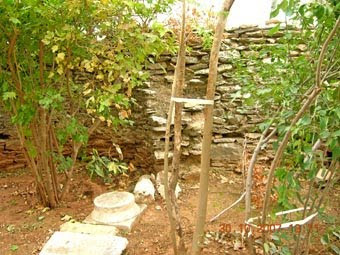 The abbot of Penteli, Theoklitos, had cells built for the nuns and gave them land to farm by which to live. On March 18, 1971 under imperial edict (there was a King in Greece at the time) the metochion became autonomous from Penteli and became a coenobium once again. The monastery today looks very different from what it did in 1963, as it expanded for the needs of the nuns and has been beautified. One of the most interesting features of the katholikon of Ntaou Penteli Monastery is that this one church has a total of eight altars. 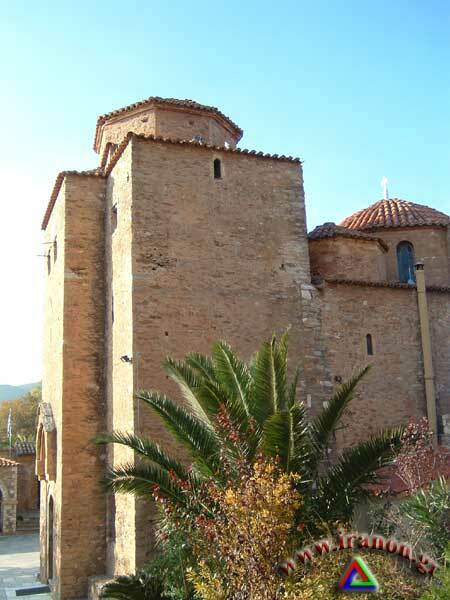 This indicates that Pantokratoros Monastery was one of the rare akoimiton monasteries of the Roman Empire, that is, it was a monastery in which there was continuous prayer twenty-four hours a day and seven days a week. Akoimiton means "unsleeping". The only reason a church would need eight altars is because canonically the sacrifice of the Holy Eucharist cannot be performed more than once on the same day by the same priest on the same altar. With eight altars eight Divine Liturgies can take place in one day with eight different priests. The location of the bodies of the 179 martyrs remained unknown and lost to time when the nuns arrived in 1963. All the records indicated that the martyrs were buried by the monks of Penteli Monastery, but not where they buried them nor do they give the names of the monks. The nuns tried looking for the burial spot, but came out empty handed. What was completely unknown to them however was that the murdered monks were buried inside the monastery and not outside as they had assumed. 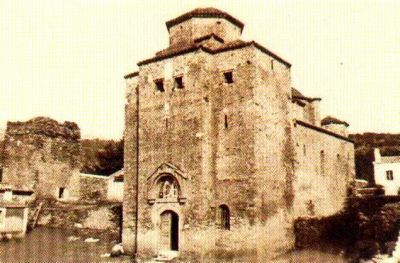 In September of 1963 work on the monastery began. 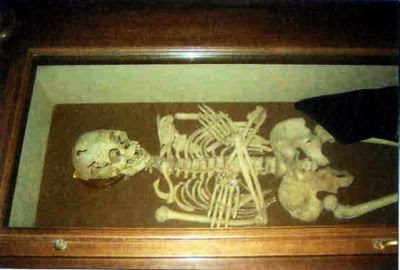 The nuns prayed for forty days that a discovery of the relics would be made. In the afternoon of the fortieth day the discovery was made. 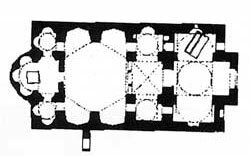 The first 65 bodies were discovered by the abbess (Styliani) and nuns inside the katholikon when workers were working on the floor tiles replacing them with new ones. It was then that they noticed a beautiful fragrance not only in the katholikon but throughout the monastery. 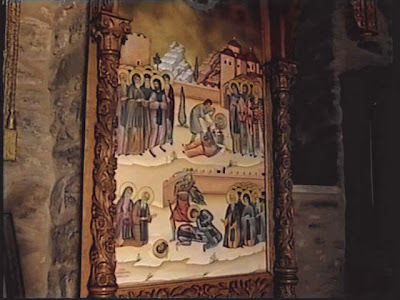 The abbess, understanding this to be a miracle of the martyrs, then requested that an excavation be done first of all in front of the Royal Doors of the katholikon in the solea. Doing so, they discovered an entire body incorrupt. They determined that this must have been the abbot at the time of the slaughter. Excavating the rest of the floor, they discovered the other 64 bodies. Upon completion, the Archbishop of Athens, Chrysostmos, was notified. He arrived at the monastery and confirmed everything. 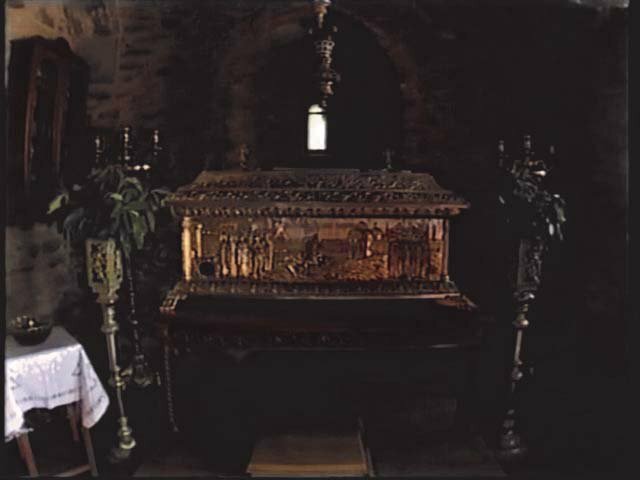 Till this day the relics of the martyred fathers continue to give off a beautiful fragrance and they flow with myrrh. When one venerates their relics, one can confirm this in person. All 179 bodies of the martyrs were not found however. 114 remained missing. Certain pilgrims, such as Elder Iakovos Tsalikes and Metropolitan Antonios of Sisani, would see lights as if from oil lamps where the graves of the martyrs are today. But Elder Porphyrios told the current abbess, also named Styliani, that the nuns "walk on top of the graves of other saints". With this advice an excavation was done in 1990 around the perimeters of the katholikon, and in truth many more relics were found. 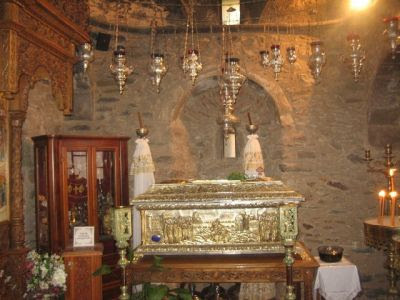 These relics were placed in a larnax within the katholikon, as well as within another chapel built next to it. The 179 martyrs were not officially proclaimed saints right away. However, because of the many miracles performed by these newly-revealed martyrs after the translation of their relics, Archbishop Seraphim of Athens requested of the Ecumenical Patriarchate an official canonization. The Ecumenical Patriarchate accepted the canonization in 1992 and established Bright Tuesday as their feast day, the day they were buried by the fathers of Penteli Monastery. We still do not know the names of these 179 martyrs. This is because the pirates burned the monastery to the ground as well as all the old records of the monastery. However, because of certain dreams of the faithful, a number of names are acknowledged. They receive these revelations accompanied with the healing done on them, whether it be cancer, disease, sickness, or whatever else. For example, one father who appears and works miracles is named Mark. Today the monastery is populated with over 30 nuns. They survive mainly through their work in ecclesiastical embroidery and garment making, as well as Byzantine iconography. Other nuns do the farm work to sustain themselves with. 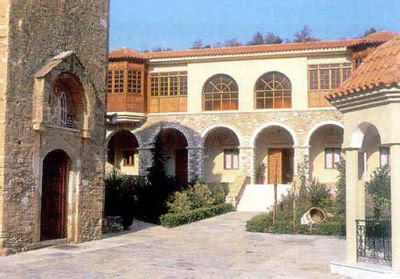 Inside the monastery is also a reputable school of Byzantine music. All but a few nuns are highly educated beyond merely a high school education. They have taken in orphans and supported their education, poor girls they have helped marry, children with psychiatric issues they have helped, and whoever visits the monastery is generously given hospitality. Recently a new church was built at the monastery exclusively dedicated to the 179 newly-revealed martyrs. It was built with the offerings of the faithful and took a little over six years to build. A certain priest named Fr. Seraphim had great reverence for the holy martyrs of Ntaou Penteli. A few years ago he began to suffer from severe headaches and travelled to Thessaloniki in order to have it checked. X-Rays revealed he had a tumor on his brain. The doctor advised him of the seriousness of the situation and the necessity for an immediate surgery. Sorrowfully he telephoned the abbess of Ntaou Penteli, and she advised him to first come to the monastery and venerate the holy relics before the surgery. Indeed he went, venerated the holy relics, and prayed for their help. The abbess then gave him a very small particle from the holy relics, which he was very moved by, and he had it put in a silver box and placed on the Holy Altar of his parish. The next day when he entered the church to conduct the Divine Liturgy, he noticed that surrounding the silver box containing the relic was a circle of something like oil. With great faith he took a piece of cotton, soaked it in the oil-like substance, and made the sign of the cross with it to his head. Following the Divine Liturgy Fr. Seraphim telephoned the monastery and informed the abbess of the miracle, and eventually sent a photograph showing the oil-like substance which came from the reliquary. Because of his great faith Fr. Seraphim put off going back to the doctor for six months, all the while praying for healing. He finally went back and received an X-Ray. To the astonishment of all, the tumor was completely gone. Απολυτίκιον: Ήχος δ΄. Ο καθαρώτατος ναός του Σωτήρος. As spotless lambs of the Savior, dashing out of various nations, the flock gathers together at Pantokratoros. Having been put to death by the rage of the barbarians, rejoicing you enter into heavenly pastures. Therefore holy martyrs of Christ, interceed on behalf of our souls. For an excellent 45 minute documentary on the 179 holy newly-revealed martyrs as well as life at Ntaou Penteli Monastery, see here.